The KEEPING WATCH on WATER project, with guest curator June Lambla, commissioned four artists to create work to explore and celebrate Charlotte’s creek system. 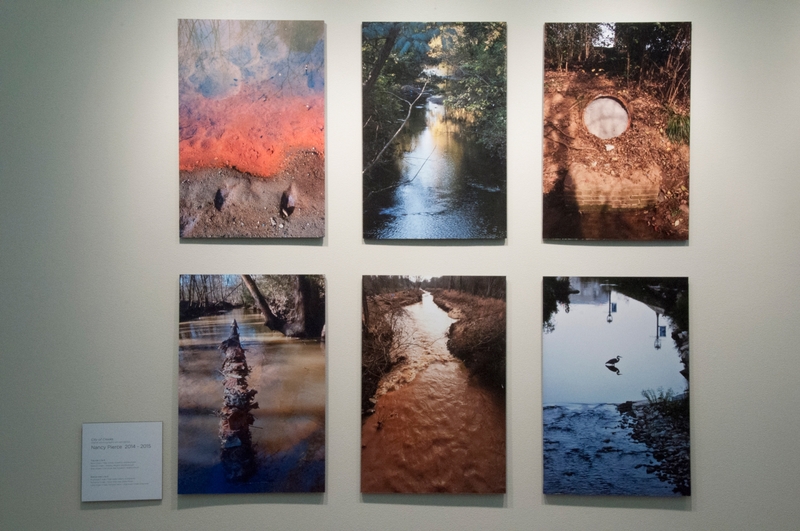 On view through Aug. 20 at the Projective Eye Gallery at UNC Charlotte Center City, the exhibition of their work explores Mecklenburg County waterways in diverse artistic media and from a range of perspectives – geographic, scientific, aesthetic, and spiritual. Photojournalist Nancy Pierce became interested in Charlotte’s waterways soon after she moved to Charlotte more than two decades ago. “The creeks were treated like irritants, conduits for trash and pollutants,” she says. She later led an initiative in her neighborhood, Merry Oaks, to provide public access to Briar Creek, restore a floodplain, and create a trail and footbridge. Pierce’s photographs became in large part the visual cornerstone of the City of Creeks project and can be seen on the gallery walls and in the front display window of the UNC Charlotte Center City Building. Also filling the front window are some of the more than 17,000 basketballs kayaker Bill Stokes has retrieved from the Catawba River. The basketballs float down the Charlotte creeks that drain into Sugar Creek and then into the river. Lauren Rosenthal’s work presents water as both a literal and metaphorical symbol of interconnectedness. Her 12-foot Mecklenburg Creeks Drawing is one of a family of maps of Southern river networks, such as the Haw in North Carolina and the James in Virginia. 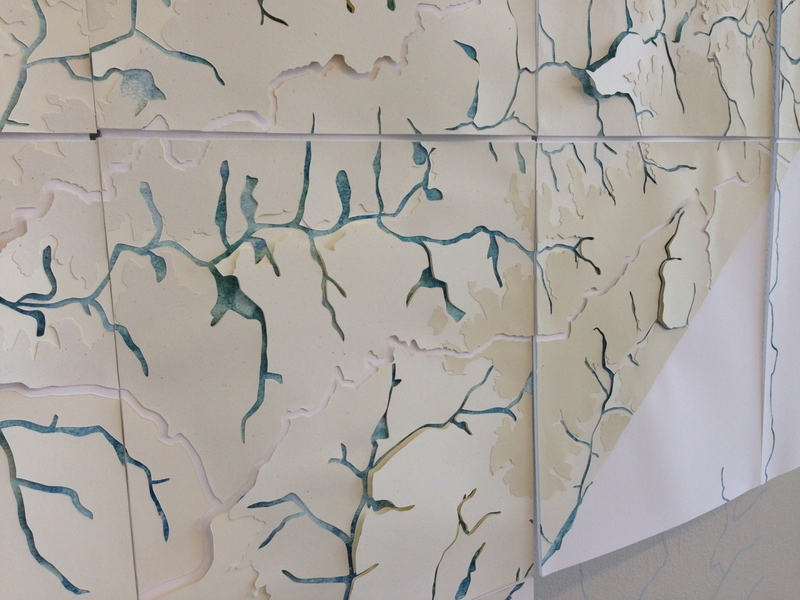 Created by cutting away layers of “ground,” the maps evoke the process by which rivers mark the landscape. 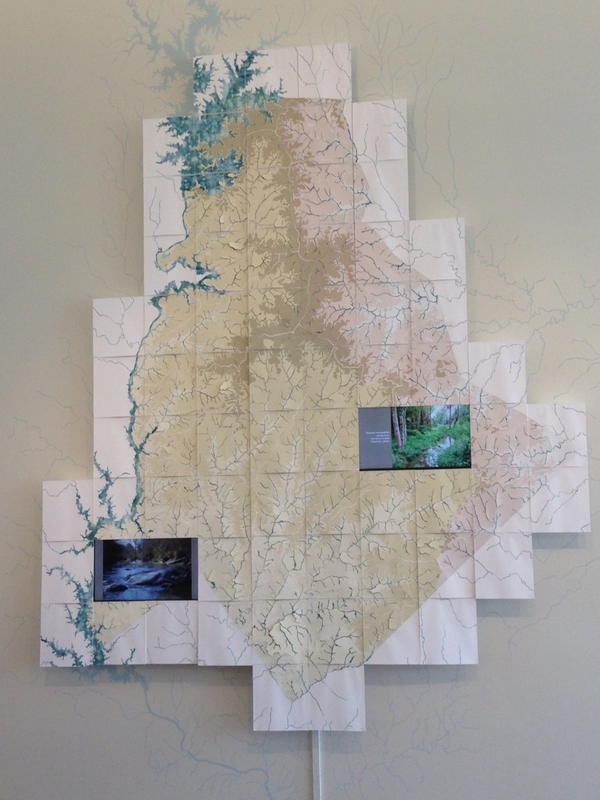 Mecklenburg Creeks Drawing became the inspiration for the online interactive map, Home Basin: Charlotte, created by Rosenthal with Wes Lawing, Tenille Todd and Mary Newsom of the UNC Charlotte Urban Institute. The public is invited to contribute to Home Basin by sharing photos and descriptions of local creeks and their landmarks. Artist Lauren Rosenthal with Mecklenburg Creeks Drawing. Photo: College of Ars + Architecture. Also in the Projective Eye Gallery is Rosenthal’s beautiful river atlas, Political/Hydrological. In this book of maps, state boundaries are determined by watershed divides, proposing a new socio-political structure for the United States. For the past decade, Marek Ranis has created a diverse body of work informed by a global investigation into climate change. As he contemplated creating work for KEEPING WATCH on WATER, he sought a new way to look at the environment – not through the eyes of scientists or ecologists but through the eyes of spiritual leaders. An associate professor of art at UNC Charlotte, Ranis joined with Religious Studies Department lecturer Tina Katsanos to interview 10 local spiritual leaders of different faiths. Those interviews, combined with aerial film footage of an entire water path from tributary to river to ocean, became the video installation Stewardship, on view in the gallery and on Vimeo. 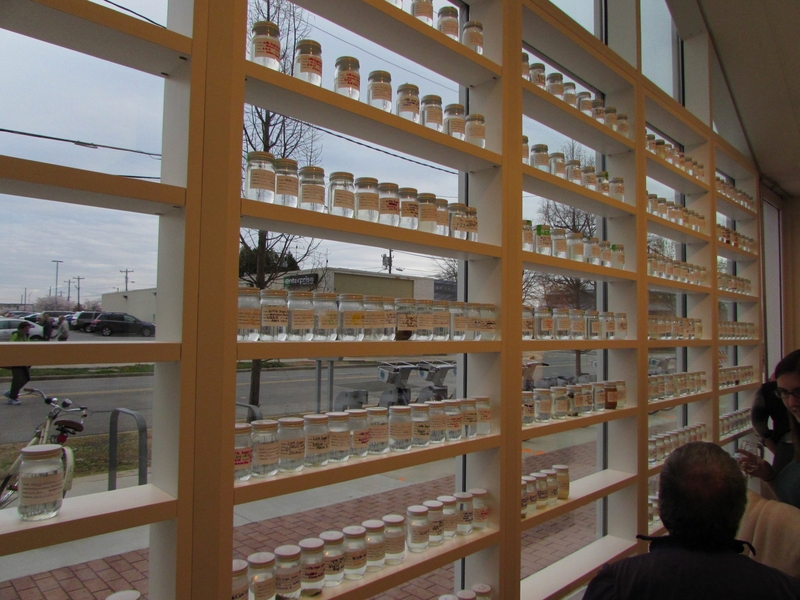 Jars of creek water, samples from local creeks, form a window of water, part of artist Stacy Levy’s Watershed Pantry at the Projective Eye Gallery at UNC Charlotte Center City. Stacy Levy is a sculptor whose interest in the natural world lies in both art and science. 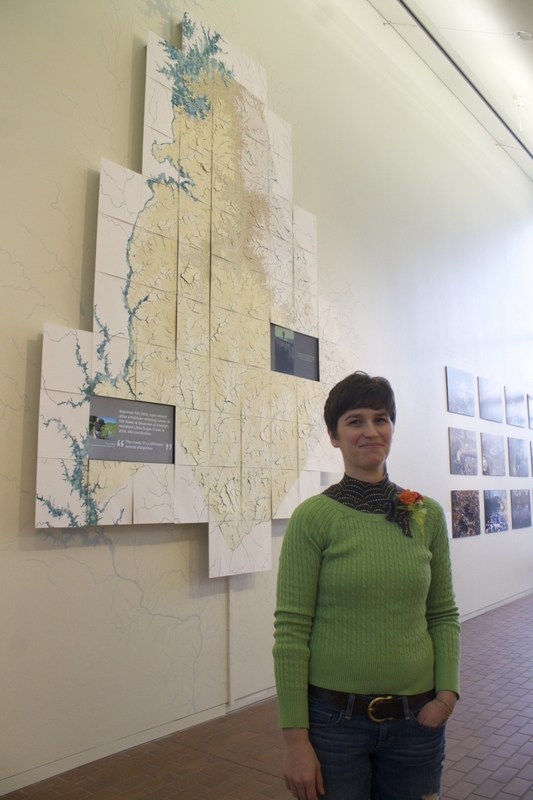 For KEEPING WATCH on WATER, she created two works: Watershed Pantry, in the gallery, and Passage of Rain, an installation in west Charlotte. Watershed Pantry invites the public to collect water from their local creeksheds and bring jars of the water to the gallery to display. Passage of Rain, constructed along a .8-mile stretch in the Revolution Park neighborhood, follows the path of rainwater from street to stream. The Projective Eye Gallery is open seven days a week, 9 a.m. to 9 p.m. at UNC Charlotte Center City at East Ninth and North Brevard streets, Charlotte.